Venezuelan President Nicolas Maduro said one of his country’s eclectic facilities was subjected by high-tech cyber attacks on Saturday. 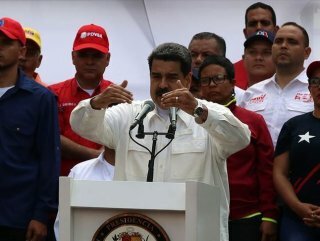 Speaking in an anti-imperialist rally in capital Caracas, Maduro said the attack was committed by using “high-tech” weapons that "only the U.S. government has in the world". "Today we have restored power supply in 70 percent of the country’s territory, but at noon, another cyber-attack was committed against one of the facilities, which until then worked perfectly. For this reason, all the progress we had achieved by mid-afternoon was interrupted," he added. He stated the spies inside Venezuela's national electricity firm are behind the power outage and vowed to identify and punish them as soon as possible. "These attacks were carried out with the use of high scientific achievements, there were electromagnetic attacks against national electric lines." Accusing the U.S. of the blackout, Maduro described the U.S. backed opposition leader, Juan Guaido as "clown" and "puppet". Venezuela has been suffering a major power cut since Thursday leaving 21 out of 23 states of Venezuela in dark. The outage was previously termed as a "sabotage". Local media outlet El Pitazo reported the outage appeared to be the result of a failure at the Simon Bolivar hydroelectric plant also known as the Guri Dam in the southern state of Bolivar. The Guri Dam is one of the world's largest hydroelectric stations and the main power supply to Venezuela's electrical grid. Venezuela has been rocked by protests since Jan. 10 when Maduro was sworn in for a second term following a vote boycotted by the opposition. Tensions flared when opposition leader Guaido declared himself acting president on Jan. 23 -- a move supported by the U.S. and many European and Latin American countries.